“Zingerman's Camp Bacon is a food lovers camp. It is a food historians camp. It is a camp that fills your mind as much as your stomach. We love to taste the bacon and you will leave having tasted a lot of bacon, but we are there to share the story behind the bacon. The history of the smokehouses. The reason why the pig is regarded as a humble animal. How pork has been featured in the White House over the past couple of hundred years. The impact of pork in the African American culture. We learn how to appreciate bacon in a whole new way, from how what we feed our animals impacts the flavor, to how different curing and smoking processes affect the final product. In the year after the book was released, Ari decided that maybe Camp Bacon didn’t just have to be a fantasy. “We have close ties to so many great bacon curers and other folks in the food community, and I think people look to us to do something different. So, we figured, let’s put it together and see if people come.” The first year sold out and included a performance from Chicago area R&B musician Andre Williams (whose 1957 hit “Bacon Fat” won him a prominent spot in the Guide to Better Bacon.) Andre returned for an encore performance at the Ark for the second Camp Bacon and the downtown street fair was added to the lineup. The 5-day celebration of all things pork kicks off with on Wednesday, June 1st, 8-930am, with a stimulating session of the ZingTrain Speaker Series featuring author, John U. Bacon. John will talk about his latest New York Times bestseller, Endzone: The Rise, Fall and Return of Michigan Football. Later that night, guests will get a taste of Zingerman's south side campus with the Potlikker Film Festival showing Wednesday, June 1st, 630pm at ZingTrain. The folks down at the Southern Foodways Alliance have done an incredible job capturing the stories behind some of our most beloved Southern food producers in a series of award-winning short documentaries by filmmaker Joe York. Join us as we watch a few new films produced in late 2015 and early 2016, all focusing on traditional Southern foodways. On Thursday, June 2nd, 1-5pm, guests will sample the first of two Bakin' with Bacon at BAKE! classes (same class is offered on Friday, as well) at Zingerman's Bakehouse. We’ll be using the power of bacon to flavor three amazing baked goods, all in honor of Zingerman’s Guide to Better Bacon (available at all Zingerman’s locations). You’ll make a similar version of our wildly popular peppered bacon farm bread, bacon cheddar scones found in the book, and sweet and salty bacon pecan sandy cookies. We’ll take you to hog heaven with a demonstration of our maple glazed bacon apple doughnuts. Try and contain yourself. Later that evening, Thursday, June 2nd, 7pm, the Zingerman's Roadhouse hosts its annual Bacon Ball feast in honor of Camp Bacon. This year, we're very fortunate to welcome Camp Bacon Main Event speaker Mark Essig, who will share stories from his new book, Lesser Beasts: A Snout-to-Tail History of the Humble Pig. Mark and Roadhouse Executive Chef Alex Young have created a menu that features bacon in all courses, leaving no part of the pig taken for granted. On Friday, June 3rd, 1-5pm, it's the second session of two Bakin' with Bacon at BAKE! classes (same class offered on Thursday) at Zingerman's Bakehouse. We’ll be using the power of bacon to flavor three amazing baked goods, all in honor of Zingerman’s Guide to Better Bacon (available at all Zingerman’s locations). You’ll make a similar version of our wildly popular peppered bacon farm bread, bacon cheddar scones found in the book, and sweet and salty bacon pecan sandy cookies. We’ll take you to hog heaven with a demonstration of our maple glazed bacon apple doughnuts. Try and contain yourself. Later on Friday, June 3rd, 1-10pm, it's a brand-new event for 2016: Fresh Taste of Detroit! Camp Bacon hits the road with Zingerman’s Food Tours this year for our very first high-energy tasting jaunt through the markets, kitchens, and breweries of Detroit. Our food adventurers will go behind the scenes to meet the chefs and taste-makers at the heart of the Motor City’s vibrant food scene. Detroit’s food scene is hot! Grounded in history with a modern high-energy twist, the spirit of innovation and soul of the city are reflected in its vibrant food and drink. If you’re hungry to understand more about this amazing rebirth through food, join us and take a behind-the-scenes tour. The Camp Bacon Main Event on Saturday, June 4th, 8am – 4pm celebrates its third year out at Cornman Farms in Dexter, MI. The festivities begin at 7:30 am with an amazing breakfast featuring plenty of bacon! An all-day event filled with meaty speakers, lots of learning, a whole lot of laughing and, of course, all the bacon you can eat! Bacon lovers from around the globe trek to the Camp Bacon Main Event each year to meet and eat and share their love for really good cured pork in a day filled with presentations by bacon producers, food experts, and a few fun surprise guests. We have a full day planned with special guests John U. Bacon; Nueske's Smokemaster, Mike Zoromski; Italian food importer, Rolando Beramendi; historian and writer, Mark Essig; noted Los Angeles Chef Sherry Yard; and many more. The Main Event is a fundraiser for the Southern Foodways Alliance, an organization based at the University of Mississippi that documents, studies, and celebrates the diverse food cultures of the changing American South. “It’s my favorite food-based educational non-profit by a mile,” says Ari. Closing out Camp Bacon is the annual Bacon Street Fair on Sunday, June 5th, 11-2pm at the Ann Arbor Farmers Market. Come on down to the market – just a block down from the Deli! – to celebrate great pork with a three-hour street fair with an array of vendors selling, sampling and showcasing all things bacon—a great way to have lunch, sample new bacon fares, or just have some fun with bacon-based games for kids of all ages. Free admission, but a donation to Washtenaw 4-H is suggested. "Camp Bacon is the thinking person's pork fest. Bacon is good to eat, sure, but some of us realize it's just as much fun to think about, talk about, and sing about bacon. I first attended Camp Bacon in 2011. The smell of smoke and fat washed out of my clothes fairly quickly, but the beautiful memories linger still." "I’m not sure I’ve ever spent a day in happier company than I did at Camp Bacon. You can’t be sad while you’re surrounded by happy people, all eating and talking about artisan bacon together. You just can’t." The Zingerman’s Community of Businesses is a family of nine independently operated businesses all located in the Ann Arbor, MI area. Paul Saginaw and Ari Weinzweig founded Zingerman’s Delicatessen in 1982. Following a successful decade that brought Zingerman’s national attention for their signature sandwiches and for their selection of olive oils, meats and cheeses from all over the world, Paul and Ari pondered various avenues for growing their business. 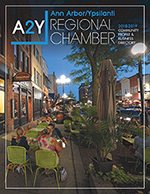 Rejecting the franchising model, they opted to develop new enterprises with entrepreneurs that would follow the Zingerman’s guiding principles and commit to doing business in and around Ann Arbor. The new business would provide goods and services that would support and be supported by each other. In 1992, Paul and Ari partnered with Frank Carollo to open Zingerman’s Bakehouse. That was followed by other partnerships that brought forth Zingerman’s Training, Inc. (1994), Zingerman’s Mail Order (1996), Zingerman’s Creamery (2001), Zingerman’s Roadhouse (2003), Zingerman’s Coffee Co., (2004) and Zingerman’s Candy Manufactory (2009) and Zingerman’s Cornman Farms (2014). Today, the Zingerman’s Community of Businesses has annual sales of almost $50 million and has received national coverage for both their food and their business philosophy from the New York Times, Saveur, USA Today, The Oprah Winfrey Show, News Hour with Jim Lehrer and many other outlets. In 2008, Paul and Ari were given the Lifetime Achievement Award from Bon Appetit.